Proposed Event Date and Time: Saturday afternoons. Call for available days. Event Capacity: We can accommodate 6-24 kids for one session and our session’s are 2.5 hours long. To large groups: If you have more than 24 kids that are participating, then we will divide the group up into 2 sessions. Participation: We do allow all kids to participate, including siblings. All participants must be five years and older. 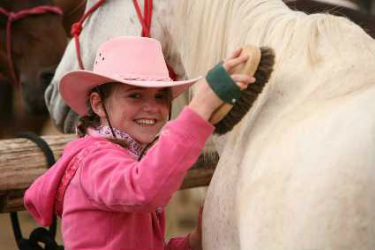 We do ask that any kids that come to the ranch need to participate in the full event. Therefore they have to have a release form signed and the participation fee paid. We are very sorry for any inconvenience, but it is no fun for a sibling to come and watch. We want it to be a great day for parents to watch and kids to participate. This is great for all kids because they love to participate! Cost: $35-$45 per participant and includes everything that is provided in the event. Program includes a 2 ½ hour interactive session, a personalized name badge, all four stations listed below, and Girl Scouts earn their Horsemanship patch. Group events are paid in cash or troop check on the day of the event. Thank you. How to make the day of the event run smooth: It is best if the leaders can collect the funds and release forms before the day of the event and have them in an file folder for us. We will need a list of all participants e-mailed to us 14 days before the event. This is so we can make the name badges.